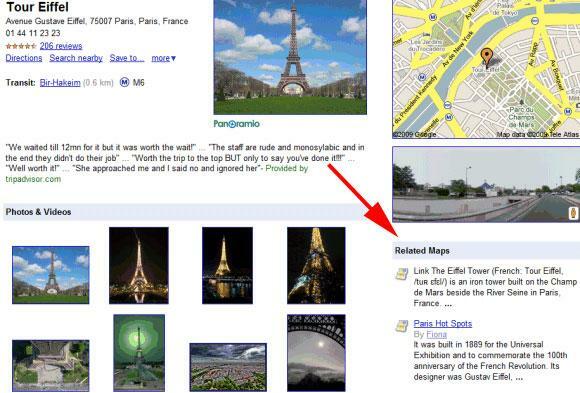 Google Maps has removed a feature or module on the Google Place pages. The removed feature is the My Maps module which was titled, "Related Maps." 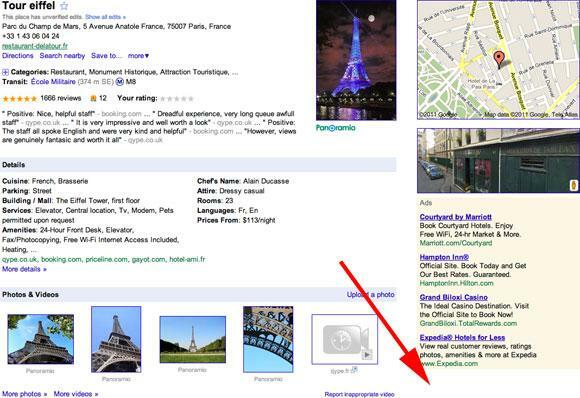 Here is a picture of the Eiffel Tower with the Related Maps module and then as you see it now, without the module. You may have noticed that the Related Maps module is no longer showing up on Google Place Pages. The team took a close look and measured which types of information users found most useful and relevant, and outlined ways to make the page more relevant to people looking for information about places. The first step in this process focused on removing excess information that our research indicated was often not useful. We’ve discovered that in many cases the MyMaps shown were not particularly relevant to the business, and that very few My Maps were getting significant traffic from these links. As such, the team decided to retire the Related Maps module on this page. This change will have no effect on the ability to create your own maps with the My Maps feature, which as always you can share and collaborate with friends, or embed on a website. My Maps is a very popular feature, and we are working on new and better ways to bring more exposure to your My Maps that will make both map explorers and map creators get the most out of custom maps.